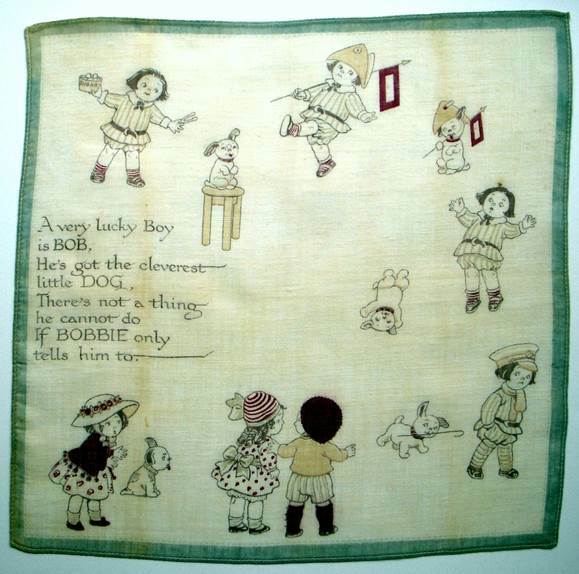 The endless weeks of scorching heat experienced in July and August are known as the Dog Days of Summer, as noted in everything from The Old Farmer’s Almanac to The Book of Common Prayer, from Dickens’ A Christmas Carol to the movie Batman. Legend has it the days are regulated by Sirius, the brightest star in the sky, which governs flood tides, extreme heat, and the moods of man and beast. Best to lie low during this time when “the sea boils and wine turns sour.” Whew! Sure, dogs may get testy when it’s torrid, but imagine how you’d respond enveloped in fur in 110 degree heat? Yet unlimited stories recount the loyalty, love, heroism, and devotion of dog to man, through not only sweltering heat, but flood, fire, ice storms and more. 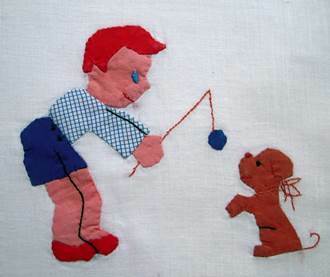 How delightful, then, to find images of man’s best friend we can carry in our pocket every day. 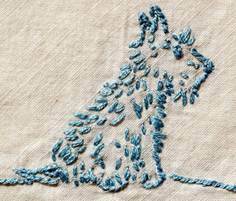 Whether scruffy or svelte, teeny or tremendous, silly or sagacious, we love these furry friends. 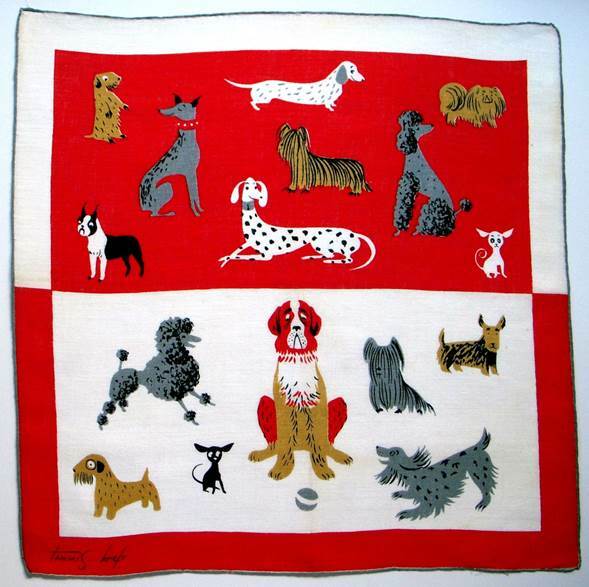 Everything from motley mutts to preening pedigrees adorns this cheerful hankie. The poor St. Bernard standing sentinel doesn’t know whether to dive for the ball or head for the hills. Because dogs not only seem to sense or moods, but mimic our behavior, they’re often depicted anthropomorphically. Here a swain sweeps his lady off her feet with dining, dancing, chocolates and portraiture. 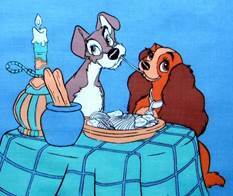 (see Flirting) Good dog. Good dog! A gang of scruffy alley mongrels pines for the upper crust femme fatale who lives upstairs. 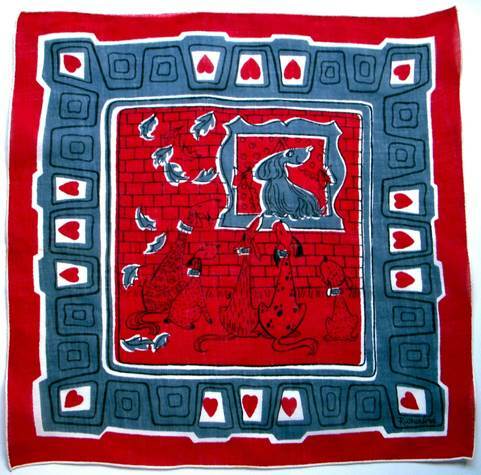 The border confirms that hearts are racing. 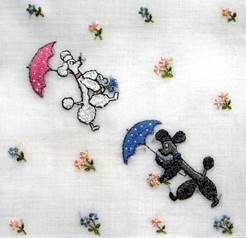 One classic depiction of puppy love was the spaghetti kiss in the 1955 Disney movie Lady and the Tramp, shown here on a charming children’s handkerchief. So memorable was the scene, Barilla pasta chose to reenact it for a commercial 57 years later, with man imitating beast! 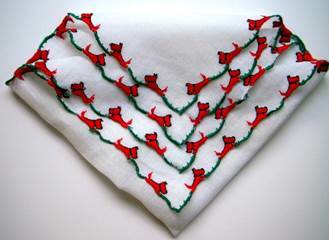 Dogs were often a favorite image used to adorn the borders of ladies’ handkerchiefs. 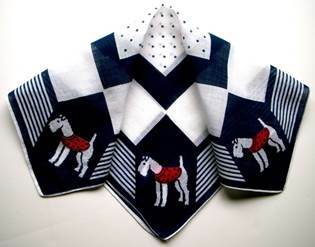 On the left, terriers in polka dot jackets, which echo the hankie’s polka dot center, anchor the corners of a crisp navy and white number. 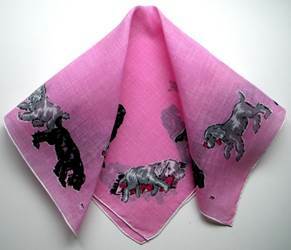 In contrast, the fluffy pups who nap and scamper along the borders of the pink hankie underscore the overall impression of friendly and playful. 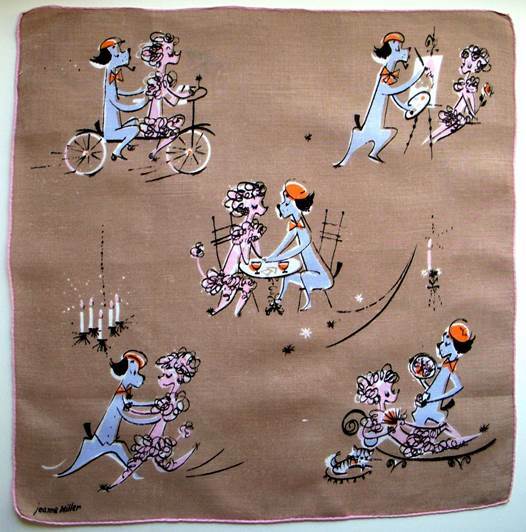 This hankie brings to mind Oprah’s faithful menagerie of spaniels. 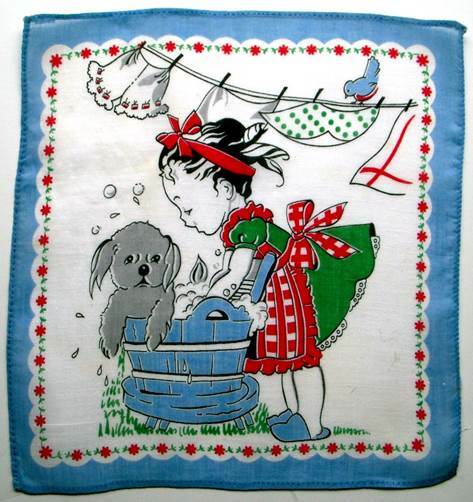 Intricate embroidery adorns these hankies – from tiny Scotties scampering in a whirlwind of red, to pom-pom poodles prancing in a shower of flowers. 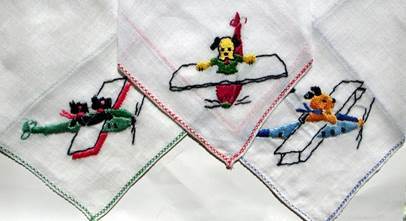 This trio of fearless flyers brings to mind Charlie Brown’s dog Snoopy, who envisioned himself the canine counterpart to The Red Barron. Play is always more fun with your pup in tow. 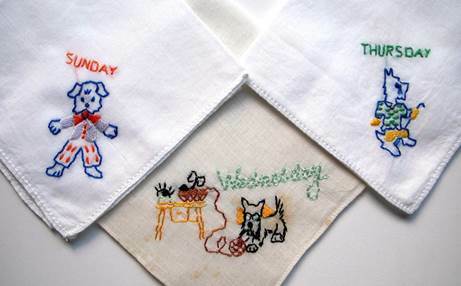 For some reason these hankies bring to mind a story a friend related about her collegiate son whose dog accompanied him everywhere on campus. When Kenethn spent a semester abroad, his roommates continued to care for the dog, who, on his own accord, continued to attend class every day – the same classes, in the same buildings, on the same schedule – obviously hoping to find his master. Talk about loyalty. 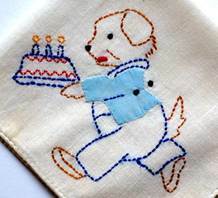 Love is reflected in every stitch of these hand crafted children’s hankies.The blue Scottie is soft enough to cuddle, while the snappy formal coat and dress slippers of the birthday pup say Celebrate! 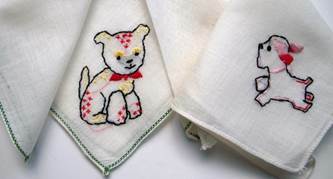 Appliqué handwork adorns these charming kiddie hankies. 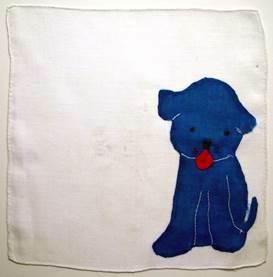 The blue pup is enormous in proportion to the overall dimensions of the hankie, yet, this is probably exactly how he’s seen through the eyes of a child. His friendly rounded ears, paws and cheeks confirm he’s a winsome companion. 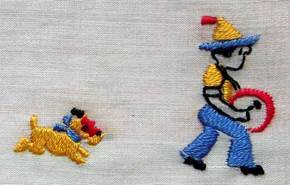 In these day of the week hankies, the naughty Wednesday pup invades the knitting basket, while his dapper pals sport a bow tie or walking stick. 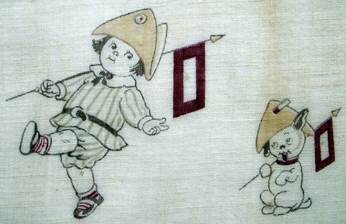 I’ve said it before, but such detail devoted to something as simple as a child’s handkerchief can elevate a tyke to the status of little gentleman, deserving of hand embroidered accoutrements. Even a small gift can make one feel special. 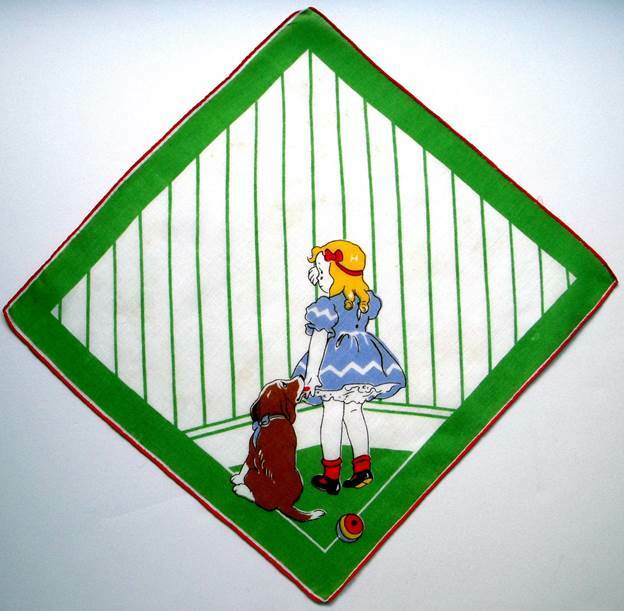 Even if you’ve misbehaved and must stand in the corner, you can be certain at least one individual will not abandon you, judge you, or turn away. 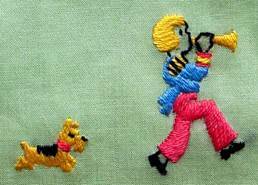 He’ll stand by your side for as long as you need him, and give you a kiss of encouragement – the faithful dog. The tiny gesture of the girl surreptitiously sneaking a touch from her pup says it all. 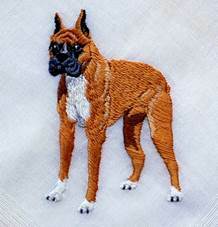 This hankie epitomizes the unconditional love of man’s best friend. Everyone from little girls to five star Generals to Presidents are aware this endorphin effect, whether they know it consciously or not. A little girl lovingly sings to and gently washes her somewhat apprehensive puppy. It may look like just a bath, but she’s sharin’ the love…. Another fabulous, heartwarming, richly written blog post. Thanks so much … what a pleasure to read!